More about this exciting concept, what it will offer, where it will be located and why! 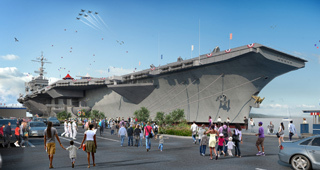 We aim to create a financially self-sufficient family attraction and entertainment center, education and job training resource, special event venue, naval and aviation museum and more, all sited on an exciting and historic aircraft carrier. The USS John F. Kennedy, named after the 35th President of the United States and nicknamed “Big John,” is the last conventionally powered carrier built for the US Navy. After nearly 40 years of active service, USS JFK was decommissioned in 2007. She now awaits her last call to duty in Rhode Island. 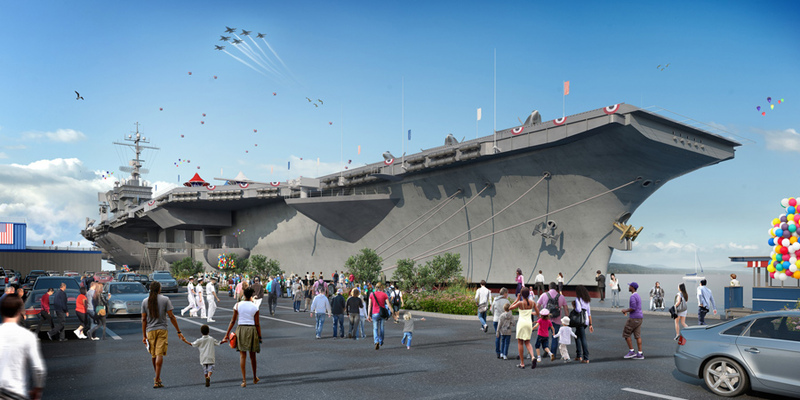 The USS JFK Sea and Air Experience will break the mold of the traditional floating museum by adding innovative technology and broad-based recreational attractions to the historic naval ship experience. The project will incorporate the best elements from other science, aviation, and maritime museums and even amusement parks. Adding recreational experiences will make the experience highly repeatable. A critical mass at inception, with enough variety to appeal to a broad cross-section of the population, will also make this a true destination. What Will the USS John F. Kennedy Offer? It will be a regional economic engine, creating jobs, adding economic impact and generating new tax revenues. Not only will this be a family fun park, but it will offer significant educational programming as well as powerful workforce development capabilities. The ship will also become an emergency relief asset in case of disasters. Newport County needs a facility to handle large groups. The ship’s 75,000 sq ft hangar bays, with 25’ overheads and no columns, will handle almost any imaginable event, from major trade shows to weddings. During the warmer months, the 4+ acre flight deck will be perfect for concerts under the stars. The ship will appeal to all ages and demographics, especially families and children. Rare military aircraft will populate the hangar bay and flight deck. Motion simulators and other interactive elements will make up a “Virtual Theme Park”, with attractions such as a laser tag complex for family fun. The largest warship ever made accessible to the public will serve as a fitting memorial to members of all services who made sacrifices for this nation. Historical displays will chronicle the service of the USS John F. Kennedy and the men and women who served on her, as well as that of the USS Saratoga, the USS Ranger and other ships. Additional exhibits will focus on the naval and aviation history of Rhode Island (for more on that, please see the RI Aviation Hall of Fame website). 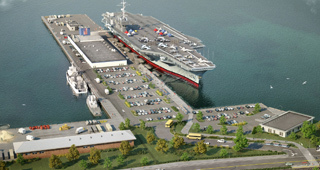 Where Will USS JFK Be Located & Why? 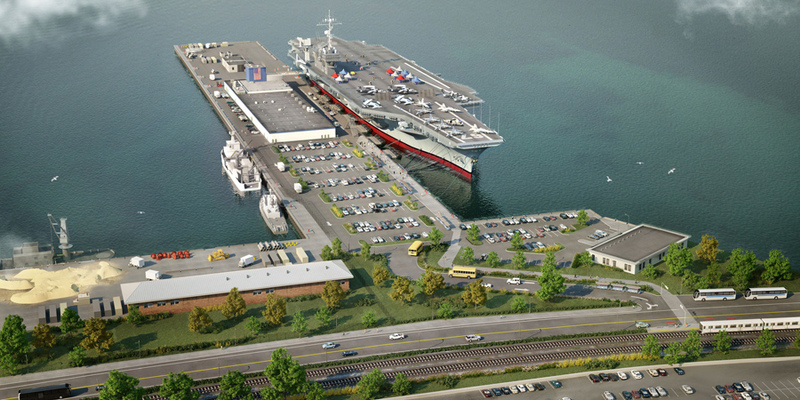 The ship will be berthed on the Newport (east) side of Narragansett Bay. Not only is Newport a world-renowned tourist destination and sailing mecca, but it is only a few miles across the Bay from the “Birthplace of the American Navy”. Nearby Naval Station Newport houses the United States Naval War College, the Naval Undersea Warfare Center, and a major Navy training center. Locating this namesake legacy in Newport County would be most appropriate given President Kennedy’s close association with this area, including his wartime PT Boat training at Melville, his marriage to Jacqueline Bouvier in Newport and the Summer White House years at Hammersmith Farm. When you combine the naval history of the region with the close connections to President Kennedy and his family, you get a compelling package whose success will be enhanced by proximity to major metropolitan areas. The center of Newport County is 23 miles southeast of Providence, and 61 miles south of Boston. The project will be able to tap into the 3,000,000 visitor-strong annual Newport tourist market in addition to the large population base within 100 miles.